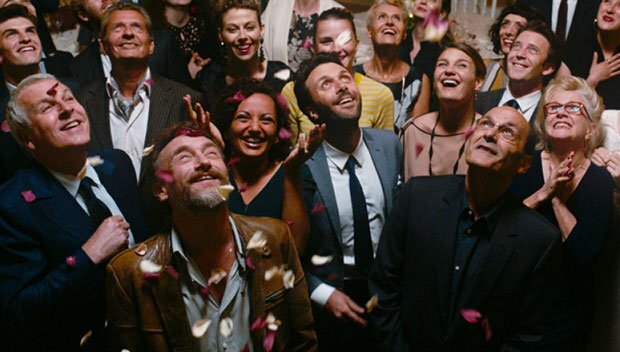 Olivier Nakache and Éric Toledano, the writing-directing duo behind French smash Untouchable, return with this charming comedy about the preparations for a chateau-set wedding. Following in the tradition of films like Robert Altman's 1978 comedy A Wedding, it's a finely tuned ensemble piece that delivers plenty of big laughs. At the centre of the action is Max (Jean-Pierre Bacri), the head of a catering company with wedding planner duties, whose motto is 'We adapt'. That phrase is tested to its limit with the impending nuptials of groomzilla Pierre (Benjamin Lavernhe) and his bride-to-be Héléna (Judith Chemla). Max's problems begin when egotistical wedding singer Etienne, aka DJ James (Gilles Lellouche), turns up as a last-minute replacement and quickly picks a fight with Adèle (Eye Haidara), Max's foul-mouthed second-in-command. Other disasters soon follow, including a bout of food poisoning, an unexpected power outage and the fact that one of the waiters is in love with the bride. Nakache and Toledano have a strong feel for ensemble comedy, keeping multiple characters in the mix and arranging for each storyline to reach a deliciously comic climax; the highlight involves a special request from the groom – an inspired and brilliantly executed set-piece that will have you crying with laughter. The script is equally effective in the smaller moments, setting up and paying off a number of great gags and touching character beats, while ensuring that not a second of screen-time is wasted. The cast are a riot. Bacri is the master of the withering stare / sardonic put-down combo, while Lellouche is on terrific form as DJ James, and both actors share engaging comic chemistry with Haidara. Similarly, Lavernhe is brilliantly irritating as the pushy groom (a nice twist on the usual cliché) and there's a fun turn from Jean-Paul Rouve as Guy, a canapé-obsessed, selfie-hating photographer, whose young intern (Gabriel Naccache) introduces him to geo-locating dating apps, with hilarious results. Max (Bacri) is the head of a catering company whose powers are tested by the impending nuptials of Pierre (Lavernhe) and Héléna (Chemla). Charming and finely tuned ensemble comedy with a highly effective script, and the cast is a riot, with Bacri a master of the withering put-down.